You would think such a colossal monument would be impossible to miss. But think again. 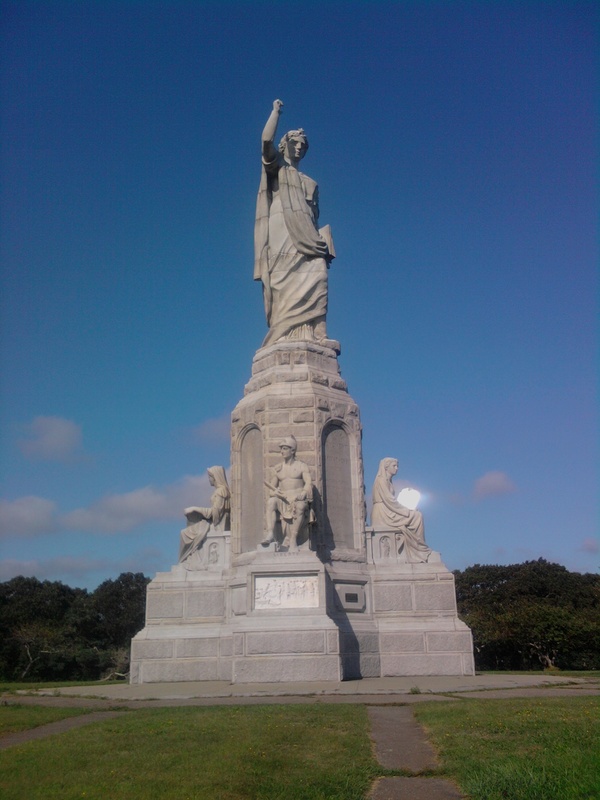 Plymouth, Massachusetts boasts the largest, free-standing, granite monument in the world. A beautiful work which will, I guarantee, take your breath the moment it comes into view. Unfortunately, the monument is now virtually hidden and I am always surprised by how few in this region even know that it exists. Yes, the tour buses go up that hill, park, and the tourists pour out to snap pictures. It is ironic. I’d bet that more people from Wisconsin and Iowa and Kentucky see the monument each year than people from Massachusetts. The National Monument to the Forefathers, dedicated to the settlers most commonly known as “Pilgrims,” was built through the efforts of the Pilgrim Society. When the organization was founded in 1820, the construction of such a monument was one of their primary goals. The cornerstone was laid in 1859 and the 81 foot tall monument was completed in 1889. It features a central figure, 36 feet tall, representing Faith, with four seated statues surrounding her representing Education, Law, Morality and Freedom. There are a number of smaller figures shown in relief around the base representing various other virtues as well as depictions of the Pilgrims and their journey. The monument was designed by artist and architect Hammatt Billings (1818-1874) of Milton, Massachusetts. He created some beautiful buildings and monuments including the old Boston Museum (now gone), the original monumental canopy over Plymouth Rock (which I think was far more handsome than the one there now), Concord’s Civil War monument, and a number of fine Victorian mansions across New England. He also created a number of illustrations for books and magazines…the cover of the Old Farmer’s Almanac, for instance, might just be his most viewed work…but not exactly one that anyone really stops to think about. The Forefathers Monument is generally cited as his greatest accomplishment. And it is stunning. It sits atop a hill almost a mile from the Plymouth waterfront. And here’s the rub…At the time, the location made sense, I’m sure. The landscape of Plymouth (virtually all of New England for that matter) was practically treeless. Sitting atop a decent sized hill and towering to 81 feet, the monument must have been visible for miles around. Another key advantage of its location: the old railroad line into downtown Plymouth (now gone) ran very near the base of that hill. I’m sure the tourists coming down from Boston in the late 19th century had an absolutely grand view of the Forefathers Monument. What a majestic welcome for visitors to Plymouth! Today, trees have grown up everywhere. Beautiful vistas used to abound along the South Shore. Now trees grow like massive weeds. Before anyone gets offended, I’m not suggesting we clear cut our landscape again. But a little strategic protection of visibility and views in certain places is seriously wanting. The same thing is happening to the Myles Standish Monument in Duxbury. It was once prominent from any point along Plymouth Bay. But over the past nearly 20 years I’ve watched the pines grow taller and taller until, from some vantage points, only Myles’s hat is visible. This is not what the creators of these monuments envisioned. The case of the Standish monument would be easier to remedy as the entire hill is owned by the Commonwealth and trees could certainly be cut back to improve visibility. This is not the case with the Forefather’s monument which sits on a relatively small state-owned parcel and is otherwise surrounded by private property. So, it seems likely that the monument will remain an obscure colossus.